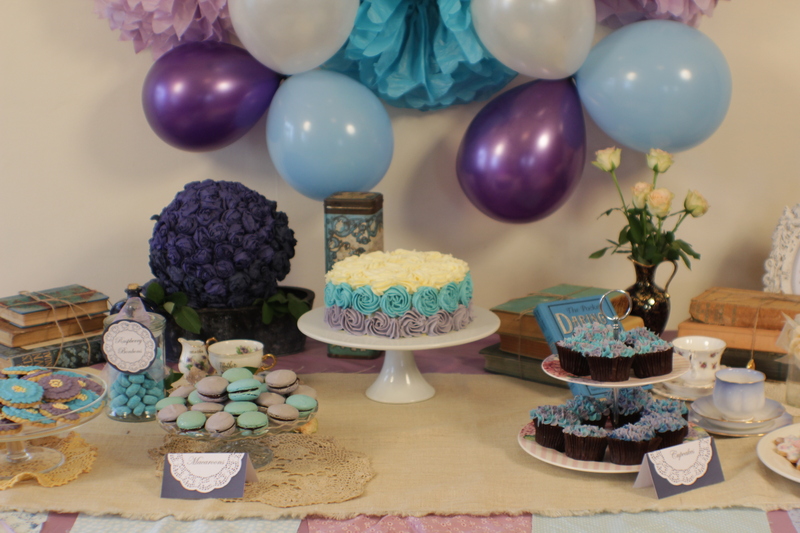 This pretty Shabby Chic Cake is one of the easiest decorating jobs I’ve ever had. 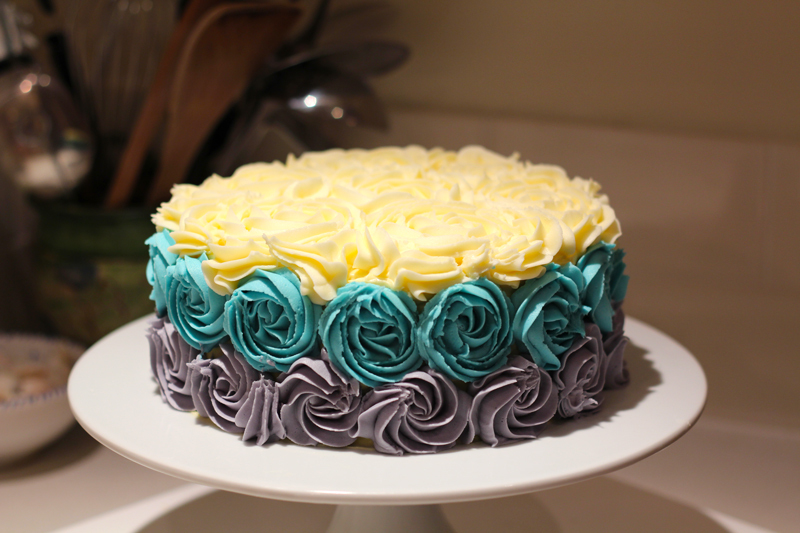 The large colorful rosettes cover the cake in a flash and there’s no sacrificing the taste for the look when it’s filled with delicious white chocolate ganache and frosted with yummy butter cream. Just follow the step by step photos and enjoy! Use your favorite reliable chocolate cake recipe. Something fairly dense, that is not too spongy is best. All that frosting gets heavy and the cake needs to be solid enough to stand up to it. They also tend to stay moist longer. Filling is dark chocolate ganache for the moat and white chocolate for the filling. Frosting is Wilton butter cream using half soft vegetable shortening (from cake decorating shops) and half butter. If you want snow white butter cream use all vegetable shortening but I prefer the taste if it’s half and half. Take equal quantities of cream and chocolate (50% cocoa solids at least). You won’t need a lot for the moat, about 8oz should be plenty, but left over ganache has many uses such as sauce for sundae’s or a base for milkshakes or hot chocolate so don’t worry if you have some left over. Heat the cream in a heavy bottomed saucepan until just starting to simmer and take off the heat. Break up your chocolate into small pieces and stir into the cream continuously until and smooth chocolate sauce has formed and there are no chocolate lumps. Allow to cool. While still warm but not hot enough to melt it add two tablespoons of butter and beat until combined. Then let set until piping consistency. You can store ganache in the refrigerator for several weeks in a covered container just remove and allow to come to room temperature before piping. Place all ingredients except butter in a heavy saucepan and heat on low till the chocolate has melted and the ingredients are combined. Remove from heat and allow to cool completely. Put cooled liquid into the bowl of an electric mixer and using the paddle beat at a high speed adding the butter piece at a time. Warning white chocolate ganache can split and curdle follow these steps if you get into trouble. Visit our Etsy shop for the matching printables.